The year seems to be “flying by”. It has been a busy month of March. The priests of the Southern African region gathered here at Kangelani Way for a week-long synod from 10th to 15th March. The community welcomed and supported them so well; many thanks to all who contributed meals and teatime treats, and who participated in our Community Evening. It is necessary to single out just one name: Sharon Cox. Thank you, Sharon, for the co-ordination and management of the logistics for the synod. If March was busy, then we are in for a “full gallop” through April and May. April brings us Holy Week and Easter. 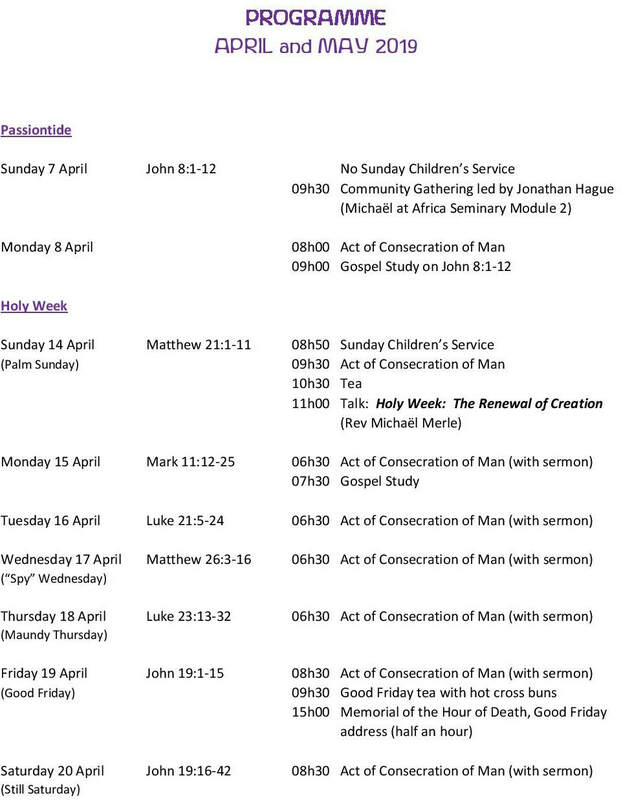 We have a full programme in Holy Week – please take careful note of dates and times for The Act of Consecration of Man. May heralds confirmation Sunday, and that looks to be a festive and joyous day for us all. We shall welcome Reingard here as Lenker and celebrate this step in life from childhood to youth with the grace of the sacrament. From Easter onwards there shall normally be an Act of Consecration of Man celebrated on Wednesday mornings at 06h30. This brings our weekly services to two: Monday morning at 08h00 and Wednesday mornings at 06h30. We hope that the Act of Consecration on a Wednesday morning can become a regular part of the weekly rhythm for a good few of you. There will be an Act of Consecration every day in Holy Week and a Memorial of the Hour of Death (Good Friday Address) at 15h00 on Good Friday.